Sew Can Do: 2011's First Craftastic Monday!! Happy New Year! It's the very first Craftastic Monday of 2011!! I'm really excited about all the things to come this year. I've got TONS of big news, new projects, fun crafting gear & giveaways to share. At this very moment I am on a family vacation, which hopefully means I'll be ready to start the year rested & refreshed. Or at least my kids will be anyway. But I'm looking forward to crafting it up for 2011!! 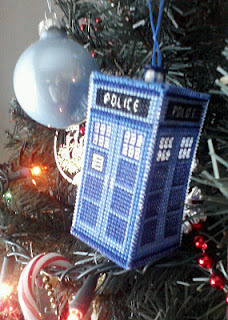 The Auld Grey Mare rocked it out of the park with her TARDIS ornament. For those of you wondering what the heck that is, it's Dr. Who's spaceship. Very hip with the geek crowd. How about this ultra creative ring design by Mich L. In LA that uses the cap from a hotel shampoo? Check out this cool idea from Eye Spy DIY! for making your own stamps out of erasers. I am so trying this when I get back home! not to be a stickler or anything, but it's TARDIS. all caps. yes, i am a geek. Yes, I don't see a linky either!!! How excited was I to wake up this morning and see my eraser stamps up here! Thanks so much and happy new year to you! Whee, hi, Cheryl, happy new year and thanks for mentioning me! I found your party and joined. I am your latest follower. Thanks for hosting. Hope you are having a great vacation. I'd love if you would come check out my blog at www.diybydesign.blogspot.com. Hope you follow me back. Thanks for keeping the linky open longer. It took me a bit longer to get back over here but I'm all linked up now! Thanks a bunch.